I found it very interesting that there are so many books that included Latino characters. 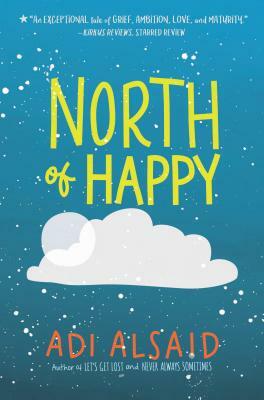 I had the chance of reading a book called North of Happy from Barnes and Nobles. I feel as though this book would be most appropriate for middle school children because there is some light romance involved. I find it interesting that this books wasn’t a book that dealt with typical issues associated with Mexican character like drugs, narcos, and poverty. This was a very refreshing book because it showed that there are some upper class Mexicans too who live in Mexico. I really like the character Carlos because I feel like he is a strong character. He was able to leave his family and go to the United States in order to pursue his dream. I know how hard it is to leave family behind because when I came to the United States I left most of my family behind too. While battling the grief of his brother’s death, the author Carlos doesn’t let that get In the way of his passion of cooking. He managed to get a job working with one of most professional chef and made strong relationships along the way, including with the chefs daughter Emma. I also thought it was nice that the book included a little bit of Spanish to help the readers learn some phrases. I learned a couple of phrases that I will surely use when meeting Spanish speakers. I also really like the illustration of the book because the colors were very vivid. This was a great refreshing book and I would recommend it to everyone. Wow! The review of this book has left me wanting to read more. It is refreshing to see new books with latinx characters in them, whereas the reviewer mentioned there is no poverty or immigration involved. It is nice to shed light to that once in a while, but as a community, we are much more than that. Even though I am not Mexican, I can see myself being portrayed in this book so much. You can tell this book has universal themes that many people could relate to on a personal level such as mental health. The way our society has grown and even the Latinx community, we have evolved to the idea of actually acknowledging that mental health is an issue we need to address. Also, this can address to many parents out there to let their children do what they want once they get older and not have them choose their career. It will take a toll on the family and the child. It also talks about death and how people grieve in many different ways. This is a book that is definitely going to be on my reading list! This is a very interesting book. As soon as they mention the characters are from a Mexican background it grabbed my attention. It is very hard to find books that involve the hispanic culture. I,myelf, coming from a Mexican heritage,I always like to see how authors and writers portray the culture in their storyline. I feel it is very important to give facts more than opinions. It is why it breaks my heart when they reviewed this book title, the first thing they say about Mexican culture is bad influences. They portray Mexican Culture to be this drug lord, illegals, and poor culture. When in fact we have so much more to offer. The love story and wanting to be a chef brings warmth and allows for a more powerful connection with the readers. It had ideas and topics that shows students that anything is possible. An tragic moment, reaching for your dreams and goals, and listening to one’s parents are real situations that makes a person strong. It defines who they are and this book is a perfect example to help a student who could possibly be going through something similar as the main character. I know I can connect on many ways since I come from the same background.